Add a useable item to the player inventory, allowing to change the various decisions and events one made during a playthrough. Ideally to be used on post-coronation or post-epilogue savegames. I believe it may work on other savegames before importing these in Awakening, but it wasn't tested. 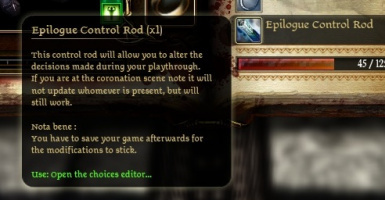 - Save your game to keep your modifications warm, and do it on a new slot. Don't overwrite anything, you never know. - Import the new modified savegame in Awakening.